Astro Find is yet another adware program that has been roaming the web lately. On its official website this ad-supported tool is advertised as a tool that should provide you with various discount deals and coupons; thus, helping you save money while you are shopping online. If you are a frequent online shopper, it might seem like a great tool to have; unfortunately, such statements are rather misleading, to put it mildly. In fact, such marketing technique is used by the vendors of this program to lure naïve Internet users into downloading and installing a program that holds no valuable features whatsoever. In reality, this ad-supported program will do the opposite of what it should; it will cause various disruptions almost every time you surf the web. To regain the standard functionality of your web browser you need to delete Astro Find as soon as it is found on your computer. During research, we have dissevered that Astro Find belongs to an infamous SuperWeb family of infections that includes other ad-supported programs such as Trunk Of Savings, High Stairs, Travel Output, and quite a few others. Therefore, it is not surprising that the adware program in question functions in a very similar way that its counterparts do. Once this invasive adware program enters your PC, your web browser will get filled up with an unusual amount of unwanted third-party web content. In most cases, such web content manifests itself as various third-party commercial ads, coupons, and annoying pop-ups. Sadly, Astro Find will not provide you with any useful ads or discount deals. We advise you not to click on anything that this adware might provide you with since it has been found out that some ads might be implemented with redirect links. This is a rather dangerous instance because you could be taken to suspicious or even potentially malicious websites. To avoid such situation and to restore your browser’s default functionality, you need to conduct a complete removal of Astro Find. 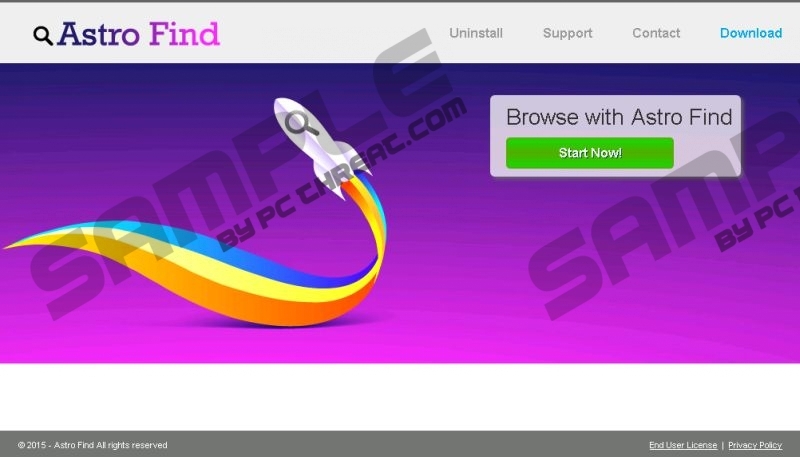 Since it is impossible to download this adware program from its official website it is not surprising that in the majority of cases this program is spread via bundled installers. If you wish to reduce the risk of getting your computer infected in such a way you need to avoid all third-party download websites since they are well known to be the primary source of software bundles. Also, make sure to pay as much attention as possible while installing any software since you could get a chance to cancel some unwanted third-party program. Last, but not least make sure to install a professional antimalware tool since such a tool is your best bet keep your PC safe and secure at all times it can warn you about any suspicious or malicious installers and websites. The removal of Astro Find is not that complicated because you can delete it via Control Panel. Even though the procedure is rather easy to make sure not skip any steps since a single mistake could mean that the adware program was not removed entirely. This is a situation that you do not want to face because it has been found out that in some cases just a few leftover files or registry entries could be used to silently restore Astro Find. Make sure to avoid such instance by running an in-depth analysis of your PC for potential traces of Astro Find to be sure that everything associated with it has been deleted. Quick & tested solution for Astro Find removal.